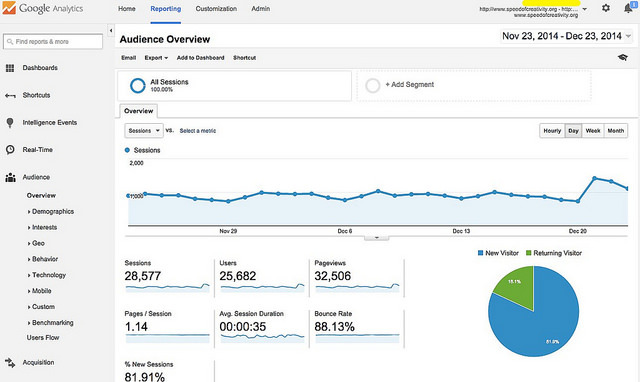 Proper implementation of Google Analytics is essential to a strong SEO strategy. Webmasters and marketers need to be able to see if users coming from search quickly return to search (a negative signal) and if they stay and engage across the site (a positive signal). It’s important to note that if Google Analytics (GA) is implemented without modifications, the data collected is almost always skewed. Google Analytics installed “out of the box” always has issues with spam or internal traffic which distorts the averages, making accurate analysis impossible. Are you concerned that you might have Google Analytics implementation issues? We can audit your site to ensure that it meets GA implementation best practices and provide you with a detailed report and checklist highlighting any issues with the tracking implementation. If there are concerns in the report, we provide explanations of why the issues impact the measurement of your website and marketing campaigns. The audit includes a discovery meeting with your staff to suggest measurable goals for the site, and a final call to walk you through the report and clarify our findings within the context of your goals. We also talk about additional recommended adjustments beyond our standard implementation process. Note: This does not include the implementation additional recommended adjustments identified within the Google Analytics audit. Those fixes would be billed at a project rate. Contact us if you have concerns about your Google Analytics implementation, or if you want us to do a free Google Analytics check to see if your data is reliable enough to support your SEO strategy.